A version of Advaita Vedanta was taught by Ramana Maharshi (1879-1950), who achieved fame in the West via British commentators. He was subsequently assimilated to some controversial American versions of Nondualism, today a rather casual word which is too seldom convincing. The Western “neo-Advaita” has aroused scepticism. Ramana was the son of a brahman (a member of the Hindu priestly caste) who worked as a lawyer at Tiruchuzi, a village in the Tamil sector of South India. His real name was Venkataraman Iyer. While still a teenager, in 1896 he underwent an “awakening” experience. The current Wikipedia article on the subject describes this event in terms of “liberation” (meaning moksha). “Later followers subsequently rationalised this event as a sadhana [spiritual discipline] which lasted half an hour and was completed on the spot. They wanted to believe that he had gained the ultimate realisation known as sahaja samadhi in this brief period of awakening, though he himself did not say that” (Shepherd, Some Philosophical Critiques and Appraisals, 2004, p. 153). Ramana retrospectively referred to his “absorption in the Self [atman].” There is the complexity that he also described his “awakening” in terms of possession, apparently his early reaction to the experience, and relayed to his first biographer B. V. Narasimhaswami (David Godman, Life and Teachings). The “awakening” occurred at Madurai, where Ramana was in the habit of visiting the Meenakshi temple, associated with Shiva-bhakti and the sixty-three Shaiva Tamil saints of the nayanmar tradition. He had read a book (the Periya Puranam) on those saints which inspired him. In his later life, he acknowledged the significance of bhakti (love, aspiration), which is something quite different to the Advaita doctrines. 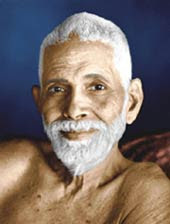 Indeed, his own report states, of his continuing visits to the Meenakshi temple (after his awakening), that he would sometimes pray for the descent of divine grace “so that my devotion [bhakti] might increase and become perpetual like that of the sixty-three saints” (Arthur Osborne, Ramana Maharshi and the Path of Self-Knowledge, London: Rider, 1954, p. 23). In 1896 he left home and school, journeying to the town of Tiruvannamalai, there staying in temple precincts and subject to an indrawn state. He eventually settled at nearby Arunachala Hill, strongly associated with the deity Shiva. His “pre-ashram” sojourn in caves on that hill was lengthy, dating from 1898 to 1922. The basic feature of that early period is one of acute introspection. He was no longer a brahman, having jettisoned the sacred thread signifying caste status. He was now an ascetic sadhu and wore a loin-cloth, not the ochre robe of Vedantic renunciates. Ramana was not an official Vedantin or sannyasin. Devoted attendants saw to his simple needs and protected him from intrusions, diverting unwanted sightseers who thronged the pilgrim locale of Arunachala. At first, his introspection was so acute that food had to be pressed into his mouth in order to keep him alive. Afterwards, he is reported to have accepted only a single cup of food daily, and he was accordingly emaciated. Ramana required an attendant for survival purposes, and for years (until circa 1906) would not speak to visitors. He is reported to have lost his ability to speak normally until that juncture. A different kind of problem was jealous sadhus, local holy men who resented his increasing fame. 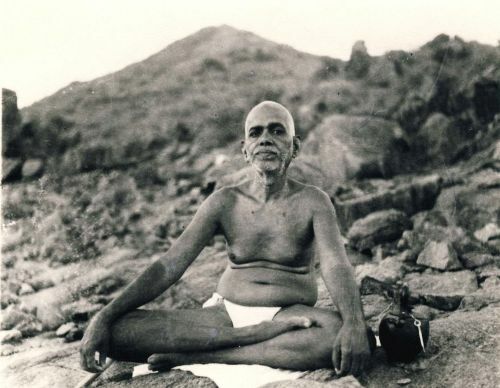 A visiting group of sadhus expressed the extremist belief that their own distant sacred hill was home to a rishi who had been practising austerities for thousands of years; this man had told them to abduct Ramana for initiation, after dramatically preparing him for the attainment of occult powers or siddhis. “Whether hemp addicts or alcoholics (or both), they evidently entertained some of the more fantastic and predatory ideas associated with Tantric Yoga” (Shepherd, Philosophical Critiques, p. 155). Ramana is reported to have made no response to these visitors; he never expressed esteem for siddhis, which are an unhealthy preoccupation. Ramana was reputed to be in samadhi, a word signifying spiritual absorption, and comprising a diffuse blanket term in popular usage. The basic event discernible is that he emerged from this absorption over a lengthy period, gradually normalising in his response to the outside world (while retaining his spiritual awareness, according to his own account). “At some obscure date he began to walk about the hill instead of sitting motionless” (ibid., p. 154). He would refer to himself as a jnani (knower, gnostic), not as a yogi, and warned about the pursuit of siddhis. He was averse to yogic exercises, which he evidently viewed as a complication. In 1922 he moved down to the foot of Arunachala Hill, taking up residence at the site which became known as Ramanashram. By 1926, the increasing crowd of visitors and devotees was sufficiently large to hinder his customary daily walk around the hill, which thereafter ceased, apparently because nobody wanted to stay behind at the ashram without him. The concession to public spotlight was accompanied by some unusual characteristics. Ramana retained a very simple lifestyle. He did not refuse visitors, but could seem indifferent to company. His statements tended to brevity; he seems to have abbreviated his jnani emphases if he considered that the audience was uncomprehending. He did not fit the customary ideas and expectations about holy men. He was notably averse to giving initiations, which were an accepted part of the popular Hindu spirituality. Ramana was often requested by admirers for permission to adopt the life of renunciation. He generally opposed this desire, a persistent trait which caused puzzlement. According to him, the effort needed was internal, and nothing to do with the formal vow of sannyas (renunciation). He evidently regarded many of the renunciates as rather distracting sources of misinformation. “He stressed the discipline of vichara (self-inquiry), which he advocated to many visitors in the spirit of Advaita [Nondualism]. He disliked the stale expositions of Vedanta associated with pundits, and he is interesting because he was completely independent of organisations like the Shankara Order” (Shepherd 2004, p. 157). Vichara has been described as an innovative feature of his communications, relating to the “realisation of the Self,” a Vedantic theme open to abuse and facile interpretation. The protractedly introverted and normalising “realisation” of Ramana affords a contrast to the glib assumptions of achieving “Nondualism” and “Self-realisation” that are frequently encountered in both India and the West, and which can give this subject a low rating in the eyes of critics. The rather lop-sided view of Ramana as an abstracted contemplative has been corrected by partisan writer David Godman. Ramana industriously prepared food at his ashram for about 15 years, and also closely supervised building work during the 1930s. He was evidently not too keen about having to sit in the audience (darshan) hall where he received all visitors; he often referred to that hall as his prison. Although an unusual teacher (and one who did not describe himself as a guru), Ramana was not venturesome in the area of social reform. According to a well known commentator, he “did not disapprove of orthodoxy in general” (Osborne, 1954, p. 77). Ramana certainly did not condemn caste norms, which were reflected to some extent in the emerging ashram management run on conservative lines, and headed by his brother, a renunciate who wore the ochre robe. The increasing number of visitors during the 1940s imposed changes, including the building of a new and more imposing audience hall to which the sage was averse. “A brahman code prevailed in the kitchens, where only brahmans could prepare the food” (Shepherd, 2004, p. 156). However, free food was dispensed to sadhus and the poor on a daily basis. The formalism of management officials is reported to have been resented by visiting devotees; there was even a request that the management be removed (Osborne, 1954, p. 120). The ashram dining hall was partitioned, the orthodox brahmans sitting to one side, while on the other side sat the lower castes, non-Hindus, and liberal brahmans. “Sri Bhagavan [Ramana] says nothing to induce Brahmins either to retain or discard their orthodoxy” (Osborne 1954, p. 133). However, “he often turned a blind eye when devotees violated caste rules” (Godman, Bhagavan the Atiasrami). Nevertheless, his apolitical worldview basically means that “he had no opinions on these scripted events [occurring in the world], and no desire to change their course” (Godman, Bhagavan and Politics). In some of his statements, Ramana appeared to endorse the political career of his contrasting contemporary Mahatma Gandhi. These two entities never met. Untouchables (harijans) were not allowed into Hindu temples at that period, including the strongly resistant Shiva temple at Tiruvannamalai. After his death, the belief developed amongst devotees that Ramana Maharshi “guides whoever approaches him” (Osborne, 1954, p. 194). Such beliefs about posthumous guidance are also found in relation to other deceased Indian saints like Sai Baba of Shirdi . See also A. Osborne, ed., The Teachings of Bhagavan Sri Ramana Maharshi in his Own Words (1962); Osborne, ed., Collected Works of Ramana Maharshi (1972); David Godman, ed., Be As You Are: The Teachings of Sri Ramana Maharshi (1985); Talks with Ramana Maharshi (2000); Gabriele Ebert, Ramana Maharshi: His Life, trans. V. Ward (2006).